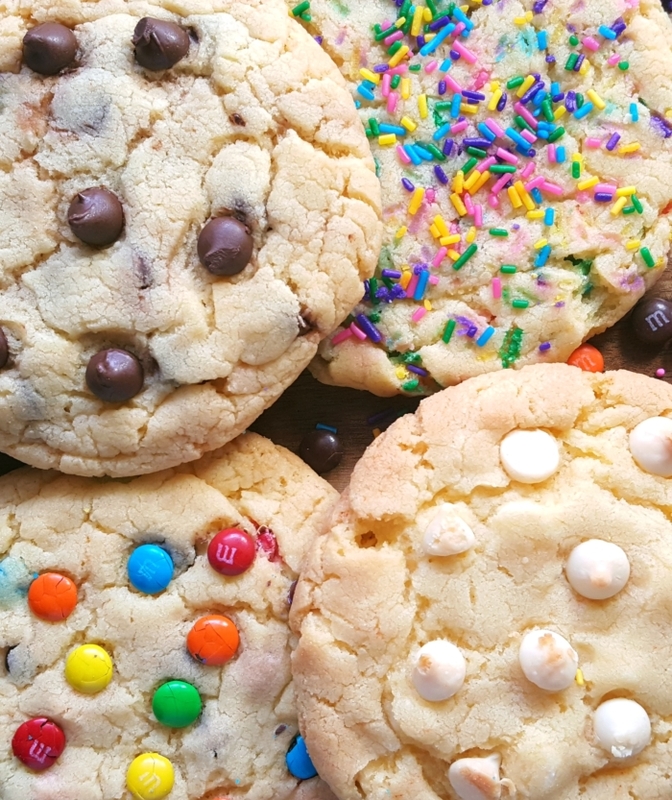 This easy 4 ingredient recipe yields big, chewy, bakery style cookies made with melted butter. 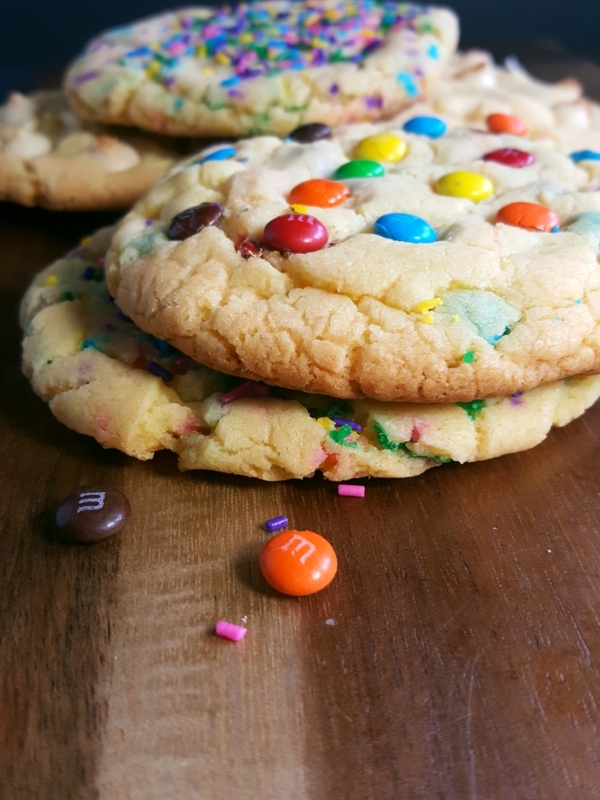 Add chocolate chips, m&m’s, sprinkles, and more! 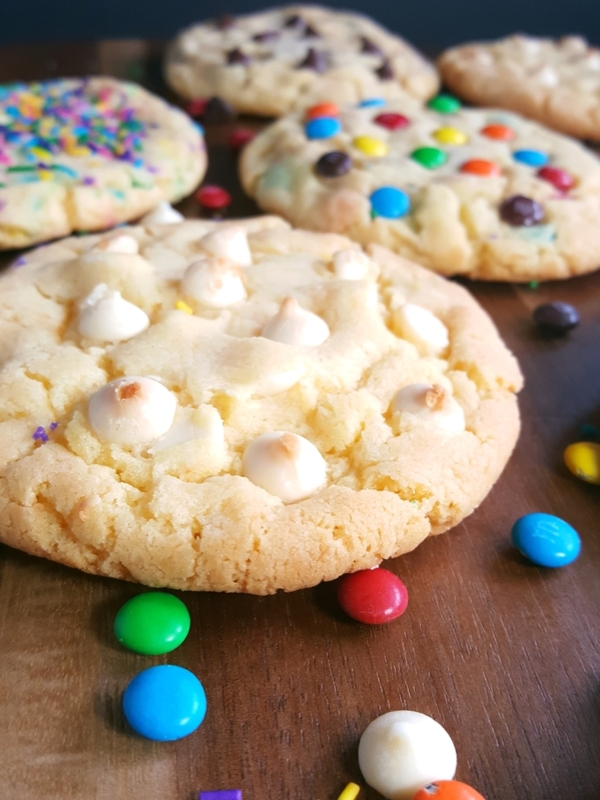 These yellow cake mix cookies are now my go-to recipe for when I want big, bakery style cookies without doing all the work. These cookies are no joke. They’re made with melted butter instead of oil and they’re big. They’re bakery style. 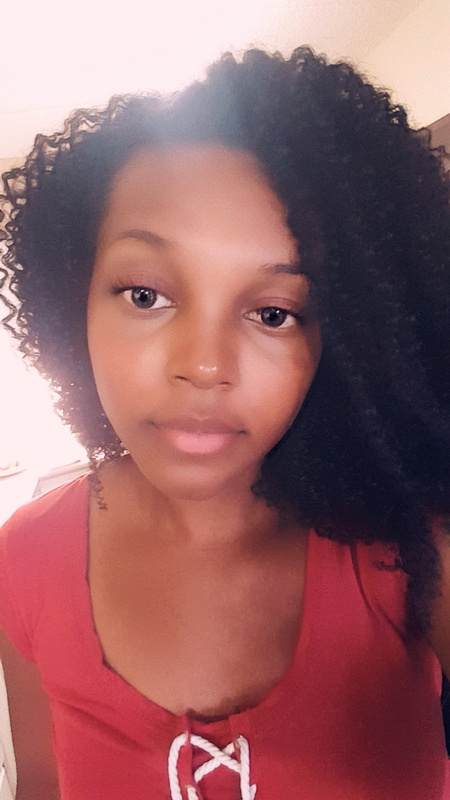 I still can’t believe I got these results from just 4 ingredients. Now I don’t have to go to some fancy café to get these type of cookies. I can make them myself right at home and I bet all of the ingredients cost the same amount as one single cookie at a café. I guarantee you that no one will guess that these cookies are made from a box of cake mix. So there’s basically the same cake mix cookie recipe floating around the internet and I’ve tried it twice. That’s right, two times! Because I thought I did something wrong the first time so I made them again but they still turned out the same way. I was really disappointed. Kind of angry, I decided to play around with the recipe to see if I could come up with something better. Something drool-worthy. I didn’t want small, cake-y cookies. I wanted big, chewy cookies. I wanted the kind of cookies that you would see in a bakery shop. No exceptions. Now, I didn’t know how close I would get to my desired result because come on.. it’s boxed cake mix. You can’t really expect anything great from that, right? Wrong! After adapting the recipe 3 times I finally got what I was looking for. 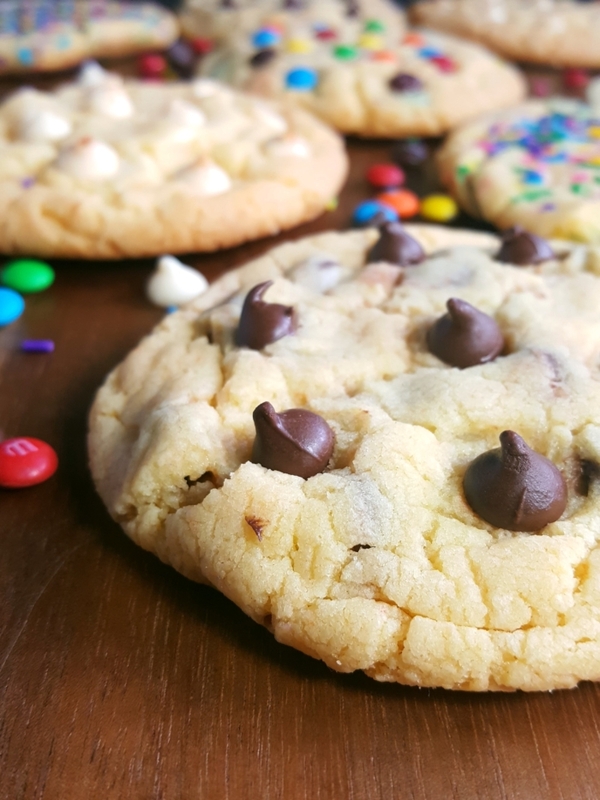 It’s really the little things that make a big difference when it comes to making cookies. I knew that if I wanted chewy cookies I would have to make some changes. I noticed something with other chewy cookie recipes. They all call for butter so that’s where I started. I replaced the vegetable oil with some good ole butter. Now, the big question was should I use softened butter or melted butter? And yes, this does make a big difference. I didn’t think it mattered but now I know that it does. Melted butter yields chewy cookies and softened butter yields cake-like cookies. So obviously you know the one I chose. So I got that part down, next it was time to figure out exactly how big I wanted these cookies to be. Most other recipes called for 2 tablespoons of dough but to me that was too small. There was no way that I was going to get bakery style cookies with that size. After doing a little research I decided to just go for the ¼ cup size. Yes, it sounds like a lot and yes I was intimidated at first but bigger dollops of dough help to create that chewy texture too. After comparing a bunch of other recipes I knew that the dough would definitely need to be refrigerated because this specific cake mix spreads a lot. 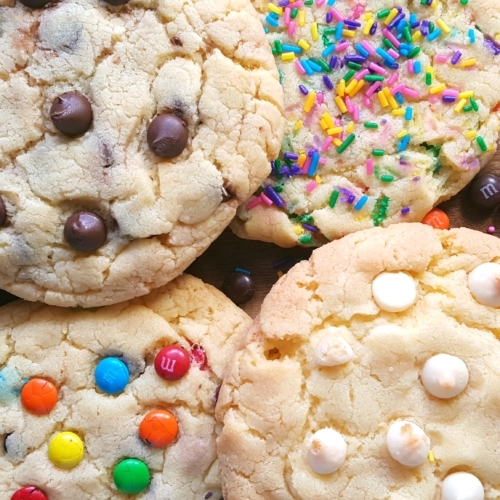 Refrigerating the dough would solidify the fat in the cookies and help them to spread a little less. This was a really good decision because if I hadn’t of refrigerated the dough I would have pulled one big giant rectangle cookie out of the oven and I did not want that. One simple thing that makes these cookies so much more delightful is baking them on a parchment lined baking sheet. When I baked them directly on the baking sheet the bottoms would get too brown, almost burnt so don’t skip this step. You can also use a silicone baking mat. I was kind of scared when I put these in the oven because I didn’t want to end up over baking them because as we all know cookies are best when they are under baked. I kept a close eye on them and I’m glad I did. I took them out at the perfect time – the cookies where golden brown around the edges and soft and chewy in the center. They were just perfect, therefore, I don’t recommend baking them for longer than the suggested time in the recipe. I was so excited when I pulled them out the oven. They were so beautiful. I think I cried a little. After I took them out I did not transfer them to a wire rack. *gasp* That’s right. I let the cookies cool and set on the baking sheet because they were quite puffy but after sitting there for a while they sank and that gooey, under baked center turned into a soft and chewy center. I’m not proud of this but I did stand there, gawking at them, watching and waiting for them to slowly transform so that I could finally eat one. Gorgeous, isn’t it? 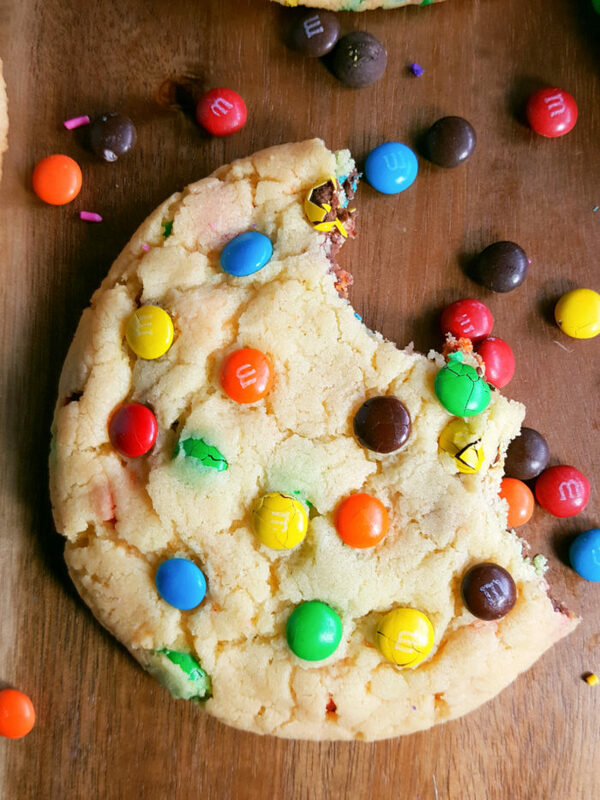 A perfectly imperfect cookie. The dough needs to be chilled for at least 2 hours otherwise the cookies are more hard rather than chewy. The baking sheet needs to be lined with parchment paper or a non-stick silicone baking mat otherwise the bottoms brown too quickly. Melted butter, big dollops of dough, and having the cookies cool and set on the baking sheet (instead of transferring to a wire rack) yields a much chewier cookie. Under baking the cookies just a little bit results in a slightly crisp edge and a soft, chewy center. Which one is your favorite? Tell me in the comments below! 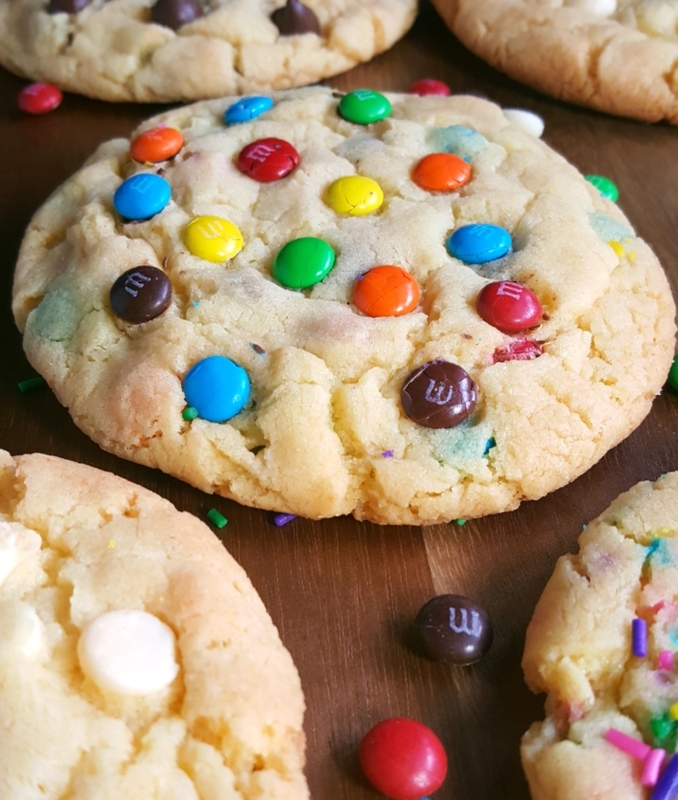 This easy recipe yields big, chewy, bakery style cookies that only require 4 ingredients and one bowl. 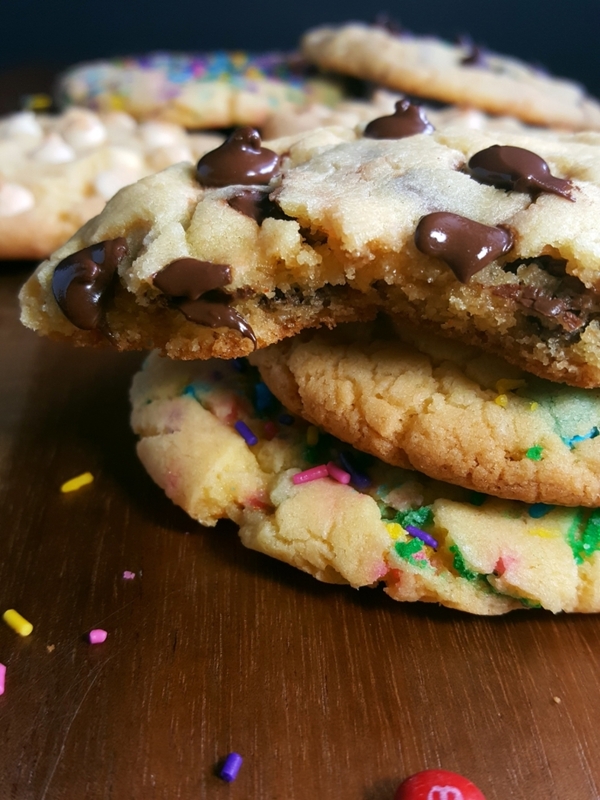 Add chocolate chips, m&m's, sprinkles, and more! In a large bowl beat together butter and egg. 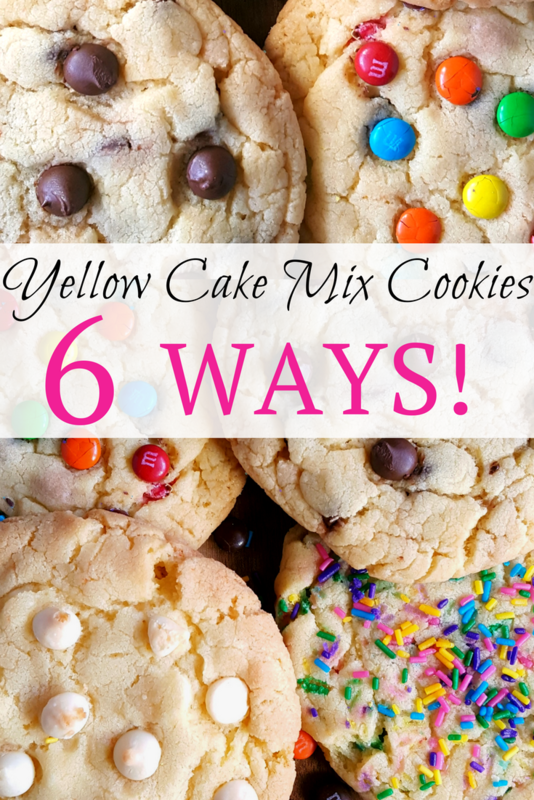 Add the cake mix and your add-in ingredient of choice and gently mix until dough is formed. Line a large plate with parchment paper (you can also use a large tray or platter). Form 1/4 cup sized balls of dough, place on the plate and flatten about halfway down with your palms. Dot the tops with more of your add-in ingredient. Cut away the excess parchment paper if there is any. Cover with plastic wrap and refrigerate for at least 2 hours. Preheat oven to 350°F. Line a baking sheet with parchment paper or a non-stick baking mat. Place the dough balls on the baking sheet 2 inches apart and 2 inches away from the edge (no more than 6 cookies per baking sheet). Bake for 14 - 15 minutes (I baked mine for 15). * Cookies are done when the edges are light brown and firm and the center is puffy, pale, and slightly under baked. Allow cookies to cool and set on the baking sheet for 20 minutes then remove. Store immediately after cookies are fully cooled. Can I add bananas to this? Do I change any liquids to compensate for bananas? I’ve never added bananas to this recipe so unfortunately I can’t say.